1. John Bishop – Winging It. Saturday, March 10. Tickets from £39.05, 8pm, Brighton Centre, 0844 8471515. Comedy superstar John Bishop has extended his sell-out UK tour and is now bringing his new show to the Brighton Centre this Saturday. Winging It will see John back on stage for his fifth UK tour, performing in his own inimitable style. His last tour, Supersonic, was watched by more than 500,000 people and received huge critical acclaim. 2. Moon River & Me – Jimmy Osmond. 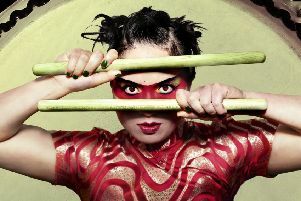 Friday, March 9, 7.30pm, £32-£75, The Capitol, Horsham, 01403 750220, www.thecapitolhorsham.com. This tribute show is packed with award-winning music, nostalgic footage and Jimmy Osmond’s own personal memories of Andy Williams. Jimmy, who made his performance debut at the age of three on television on The Andy Williams Show, will perform many of the romantic songs that made the singer so popular. Saturday, March 10, £9-£10, 7.30pm (3pm March 11) The Hawth Theatre, Crawley, 01293 553636. Forward Motion – A Day of Dance is Crawley Arts Development’s annual celebration of dance and features many West Sussex dance schools and a huge variety of dance styles. Performers will take to the stage with an array of styles including contemporary dance, world class Irish dance, jazz, lyrical, street and urban, ballroom, tap dancing and belly dancing. The groups performing this year include: The ACE Academy, Cheneler School of Dance, Dancing Roses, Euphoric Dance Company, Fi-Steps, Footloose Dance Group, HG Performing Arts, KC’s Dance & Gymnastics, Legacy, Little Dancers, Little Sparks, Louise Ryrie School of Dance & Drama, O’Brien School of Irish Dance, Pound Hill Dance Club, Sophie’s Studio, Stagecoach Crawley, Sultan Sirens, Tap Cats, TD Academy, Urban City, Vicky Cooper Dance School and Yalla Ya Banet. Monday, March 12. Tickets from £39.05, 6.30pm, Brighton Centre, 0844 8471515. Paloma Faith heads to the Brighton Centre as part of her 2018 tour with support from XamVolo. One of only two British female artists this decade to have their last three albums go double platinum in the UK, Paloma Faith released her fourth album, The Architect, in November last year. It’s her first record in more than three years and features an array of acclaimed co-writers, producers and collaborators including Sia, John Legend, Jesse Shatkin, and Samuel L. Jackson. 6. I Believe in Unicorns. Wednesday, March 14, 4.30pm, £11, Chequer Mead, East Grinstead, 01342 302000, www.chequermead.org.uk. Best-selling children’s author Michael Morpurgo’s story is brought to life in a magical interactive show (top circular picture by Richard Davenport). This intimate performance is set in a library full of books that hold more than just stories within their pages. It is a tale about the power of books and the bravery of a young boy called Tomas who hates reading. The audience is invited to bring along their favourite book (suitable for ages six and up) that will be used as part of the set on stage. After the show you can then take a different book home. The performance is suitable for families with children aged 6+. 7. Brendan Cole – All Night Long. Wednesday, March 14, £38.50, 7.30pm, The Hawth Theatre, Crawley, 01293 553636. Brendan Cole takes to the stage with his latest spectacular production. He will be joined by his superb cast of guest dancers, a captivating leading lady and the incredibly talented 14-piece band and singers. The evening will serve up a magnificent mix of Latin fever and ballroom charm. March 15, 7.45pm, £12, The Capitol Studio, Horsham, 01403 750220. Tannara (bottom circular picture) play contemporary Scottish folk music with a unique modern approach. On fiddle, harp, guitar, accordion and vocals, Tannara aim to play with a raw energy that brings booming sets of tunes together with moments of extraordinary beauty. Their critically acclaimed debut album, Trig, was produced by Rachel Newton and released in summer 2016. 10. An Evening with Brian Blessed. Friday, March 16, 7.30pm, £27, The Hawth Theatre, Crawley, 01293 553636. Larger Than Life British actor Brian Blessed is known for his hearty, king-sized portrayals on film and television. A giant of a man accompanied by an eloquent wit and booming, operatic voice. In An Evening with Brian Blessed, Brian will talk about his career on stage and screen including anecdotes from Flash Gordon, Black Adder, I Claudius and Z Cars.